If you are new to Azure, the wide variety of pricing can be overwhelming (for us too! ), so we reviewed the numbers to come up with some simplified calculations. Yes, we know these are oversimplifications but if you just need to wrap your head around the scale, these metrics should help. 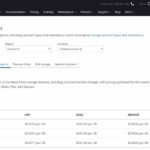 These descriptions were taken directly from the Microsoft Azure Storage Pricing Calculator and that is where you need to go to estimate your real costs.